Voltage SecureMail™ simplifies compliance to privacy regulations, including MA, PCI, HITECH, UK FSA, and EU Data privacy directives, and mitigates the risk of email security breaches. Voltage SecureMail provides end-to-end security for email and attachments, inside the enterprise to the desktop, at the enterprise gateway, and across leading mobile smartphones and tablets. The solution provides the confidence and peace of mind that sensitive data is protected in transit and in storage, wherever it is in an email system to any inbox (e.g., Outlook, Lotus Notes, Gmail, and Yahoo! ), without disrupting existing email services or business processes. Voltage SecureMail integrates with your existing message infrastructure, including Outlook, mail hygiene, data leak prevention (DLP), archive and e-discovery, Blackberry Enterprise Server, and mobile device management (MDM). As well as enterprise infrastructure, including Active Directory, identity and access management systems, and enterprise and business applications and websites (e.g., ERP, CRM, extranets, intranets). The solution can be rapidly deployed for internal and external usage, even in the largest multi-national organizations. Voltage SecureMail employs proven Identity-Based Encryption (IBE) technology which enables global scale deployments that are simple to manage and administer. The stateless architecture avoids the scale bottlenecks associated with cumbersome webmail systems, traditional PKI or symmetric key approaches. Senders and receivers benefit from a simple user interface that makes secure messaging as easy and familiar as standard email communication. Voltage SecureMail can be deployed on-premise, or delivered as SaaS from the Voltage SecureMail Cloud™. Optional add-ons include RESTful API’s for powerful enterprise integration into applications and websites that rely on email based processes, Large Attachment Delivery, Voltage SecureMail Mobile Edition for native mobile support, archive and e-discovery plugins for supervisory access, and client plugins for Windows and Microsoft Office for transparent encryption inside the enterprise. Compatible with enterprise messaging infrastructure and cloud email services such as Office 365, Voltage SecureMail allows organizations to achieve and maintain regulatory compliance and enforce best practices for email messages and attachments, without disrupting your existing email services or business processes. Essentials Edition offers gateway encryption and decryption at the network edge for outbound and inbound email. Encryption can be enforced via gateway policies or by using a “Send Secure” button from within Outlook that flags messages for encryption by the Voltage gateway. Essentials Edition can enforce policies natively, and be used combination with a Data Leak Prevention (DLP) solution. Standard Edition includes all of the capabilities available with Essentials Edition, plus it allows businesses to encrypt internal email that is sent between colleagues within the same organization. Standard Edition includes the full “Send Secure” plugin for Outlook that encrypts email locally at the desktop before it is sent to anyone, whether an internal or external recipient. Enterprise Edition includes all of the capabilities available with Standard Edition, plus it enables businesses to encrypt sensitive files and documents (e.g., .doc, .xls, .ppt, .pdf, and many others). The SecureFile Plug-in adds a simple right-click encryption experience for any type of files supported on Windows. SecureFile Plug-in also adds a Voltage Encryption button to Microsoft Office applications for simple encryption of documents directly from within Word, Excel, and PowerPoint. Encrypted files remain protected wherever they go, whether inside or outside your organization. Despite email encryption functions built in to clients and servers, the complexities of key management and usability issues mean market adoption has never been successful. Voltage SecureMail is built on unique technology that overcomes these technical and business challenges – enabling secure email to be both easy to use and highly scalable, while meeting the most advanced use cases. Since keys are generated dynamically instead of requiring complicated key storage and management, Voltage SecureMail’s stateless architecture is proven to scale across global enterprises with millions of users inside and outside the enterprise -without dedicated operations staffing overheads or help desks. The multi-tenant design permits unique branding and policy management by line of business, for tailored, personal customer experiences, varying authentication methods or regional touches. Integration into your existing messaging environment enhanced with maximum protection at the lowest cost, increasing your return on information according to business policies while putting the right data into the hands of the right people, without friction – even to the latest smartphones. Encrypted communications can be sent to anybody – inside or outside the organization. Secure email can be sent and received just like regular email; even to the most demanding consumers and business partners. Having no keys to store and manage significantly reduces infrastructure, administration, and operational costs – while lowering overall business risk due to messages that can no longer be accessed from lost or corrupted keys. Voltage’s 100% push technology eliminates creating costly parallel messaging infrastructure and hosting for encrypted email. Data-centric encryption ensures full protection of sensitive information in your email and file attachments, without security gaps where email is in the clear. Voltage SecureMail effectively mitigates the risk of email security breaches by providing end-to-end security, across desktops, gateway, business applications, and mobile devices. Powerful, standards based Identity-Based Encryption (IEEE 1363.3) eliminate key management complexity and usability challenges, dramatically simplifies IT operations, and permits global organization scale even for millions of recipients. Voltage SecureMail Mobile Edition offers a simple user experience that is designed specifically for each of the supported mobile platforms, ensuring that each app looks and behaves as users expect. All secure email is delivered into the user’s existing inbox and read locally on their mobile device, with full access to contact lists and other native features. Enterprise administrators can create specific controls for how external messages are handled including defining a list of approved domains and rules for message forwarding and replies. 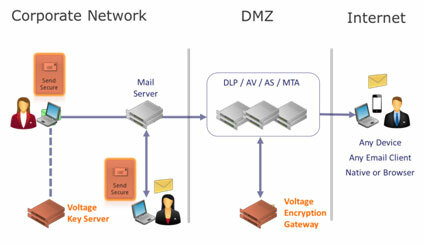 The Voltage ZDM provides full Voltage SecureMail functionality in an intuitive, web-based interface, enabling anyone to send, receive, forward, and reply to secure messages with no special software required. All messages are sent and received like standard email with no active code that can impede deliverability. Now supports a variety of endpoints for email encryption, including desktop, mobile, web, and applications. Download the Voltage SecureMail Data Sheet (PDF).